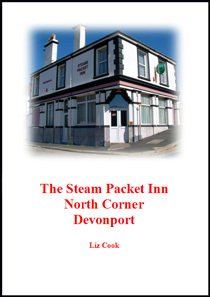 Sometime between 2014 and 2020, The Steam Packet Inn at North Corner will be 200 years old. In order to celebrate its upcoming birthday I researched the pub's history in 2004, and compiled the material into a book. The book was updated in 2007 and again in October 2009. Now, at 2012, the PDF version of this book, previously available from this page, is being revised, please check back later for the finished product (but note that I'm a slow worker).